BittWare used the 2014 High Performance Computing Linux for Wall Street Show & Conference to announce that they have entered into a Value-Added Reseller (VAR) agreement with Tamba Networks, a developer of low-latency, high-speed Intellectual Property (IP) cores for networking and financial applications. The Tamba Networks 1 to 400 Gigabit Universal Ethernet IP Core is one of the lowest latency and gate count solutions on the market, enabling a 10 GigE "FIFO+MAC+PCS" of approximately 25 ns in an Altera Stratix V FPGA. AUVSI’s Unmanned Systems 2014 is the place to see the most comprehensive collection of unmanned systems for every domain – air, ground and maritime, and meet the teams behind this exciting technology. Tech Source will also be exhibiting at SPIE DSS 2014 in Baltimore 5-9 May, presenting their high performance COTS XMC and VPX form factor graphics and video solutions to attendees of one of the industry’s most important scientific conferences and exhibition on optics, IR imaging, lasers, and sensing for defense, security, industry, healthcare, and the environment. In UEIPAC systems, the VxWorks application runs directly on the UEI RACK or Cube, with no need for a separate host PC. You can now take advantage of UEI’s popular UEIPAC chassis and continue to develop your applications in VxWorks. This powerful combination provides hard real-time performance, an extremely robust and reliable operating system and allows you to develop your application in a familiar environment. Extreme Engineering Solutions, Inc. (X-ES) has introduced two new Freescale QorIQ T2080 and T1042-based modules – the XPedite5970 and the XPedite6101. 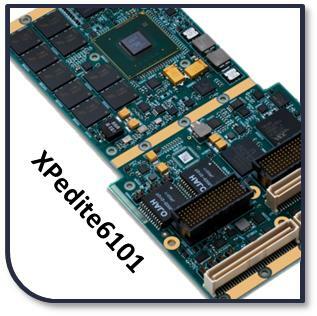 The XPedite5970 is a 3U OpenVPX™ REDI module based on the T2080 processor, and the XPedite6101 is a conduction-cooled XMC or PrPMC module based on the T2081, T1042, or T1022 processor.